Eyelash extensions are one of the best and most popular ways to enhance your natural beauty. Your eyes are the main focal point of the face; bright, healthy-looking eyes make you appear youthful and more attractive. For details on lashes in Lahore that’ll turn heads, read on! Lustrous, healthy-looking lashes make your eyes appear larger, brighter and more awake. Adding lash extensions is a safe, long-lasting cosmetic enhancement that gives you naturally longer and thicker eyelashes. Applying your own false lashes can be time-consuming and messy. Lash extensions, on the other hand, are an easy, natural-looking and painless way to get the lashes you’ve always dreamed of: now available at Shumaila’s Beauty London on MM Alam Road Lahore. You may have heard of lash extensions, but how exactly do they work? What does the procedure involve? 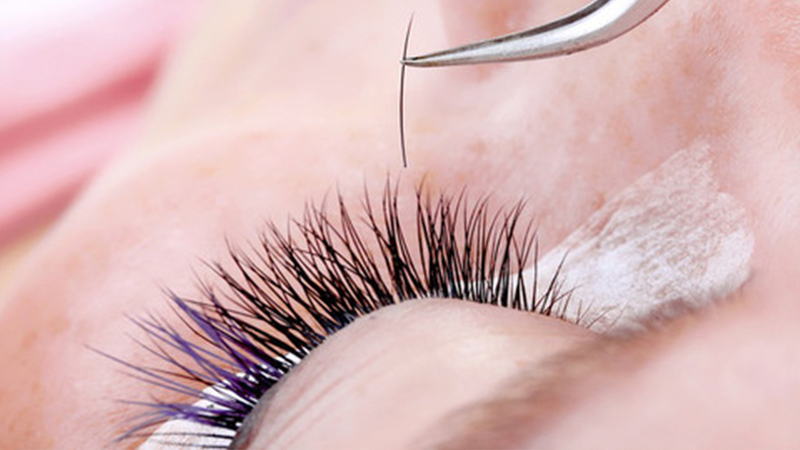 Here’s everything you can expect when recieving eyelash extensions in Lahore Pakistan. Before attending your session, make sure your face and eyelid area are clean and clear of makeup. This will make it easier for the technician to apply the lashes. Unlike regular false lashes that you apply at home, lash extensions consist of individual lashes that are gently bonded to your natural lashes. Each extension lash is dipped in a medical grade glue before being attached seamlessly to your existing eyelashes. The full application process takes between one and two hours and can last up to six months with regular touch-ups. The subtle way to make your eyes stand out beautifully, many women opt for the classic individual lash extensions. The lashes are carefully adhered to by a professional with a pair of tweezers. Lash extensions allow for the natural growth of your own lashes alongside them, for the perfectly subtle lash enhancement. These lashes are available in a range of different lengths and thicknesses. We use high quality & vegan-friendly synthetic lashes from Nouveau. The must-have for ladies wanting longer, fuller lashes, Russian Volume eyelashes are a bolder statement than the classic extensions. Unlike strip lashes that you might apply at home, these lash extensions give the appearance of naturally full, thick and feminine eyelashes. Fans of lashes in Lahore are loving the Russian Volume look. Russian Volume lashes are applied in a very similar method to that of the classic lash extensions. The technician will affix the extensions to your natural lashes – the only difference here is that they are applied in 3D fan shape, rather than as individual lashes. Got a question about lash extensions? We’ve got the answers you’re looking for. A: Lash extensions are semi-permanent and last around the same time as your natural lash cycle. They can last for up to 1-2 months if you get regular touch-ups every 2 weeks. Q: Will the extensions damage my natural lashes? A: No. The adhesive used with lash extensions is designed for use on the body. Its gentle formula does not damage your natural lashes. To keep your lash extensions looking fabulous, avoid using mascara, heavy eyeliner or oil-based products around the eyes. If you’re looking to purchase eyelash extensions in Lahore Pakistan, we hope you now have all the info you need to make the decision.